New and experienced sellers alike deal with gated inventory quite frequently these days. There are also occasions when you are gated but you can “Request Approval”. This process may be easy or hard, depending on the brand’s requirement. Sometimes you will need to provide an invoice and a letter from the brand authorizing you to sell their products. Sometimes you press a button and get approved on the strength of your seller account. Today we’re going to go over your options for gated inventory that has not been shipped. 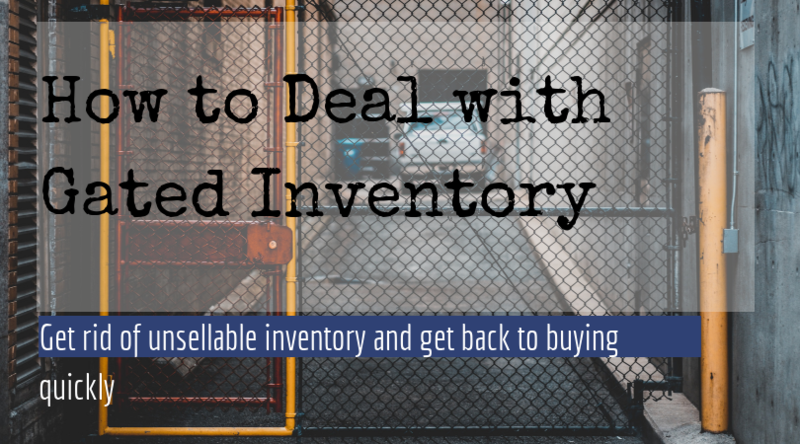 Dealing with gated items is a massive hassle, so the best thing to do is avoid it entirely if you can. Before purchasing ANYTHING be sure to verify whether you can sell it. There are two main ways to do this. You can use a paid plugin called “Check Permission” which creates a little box right on the page you’re viewing. 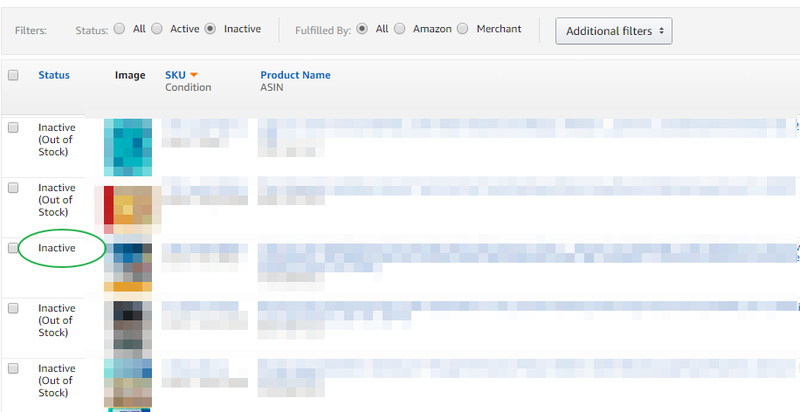 Or the free way is to log into Seller Central, go to Inventory>>Add a Product and search the ASIN of the item you want to sell. 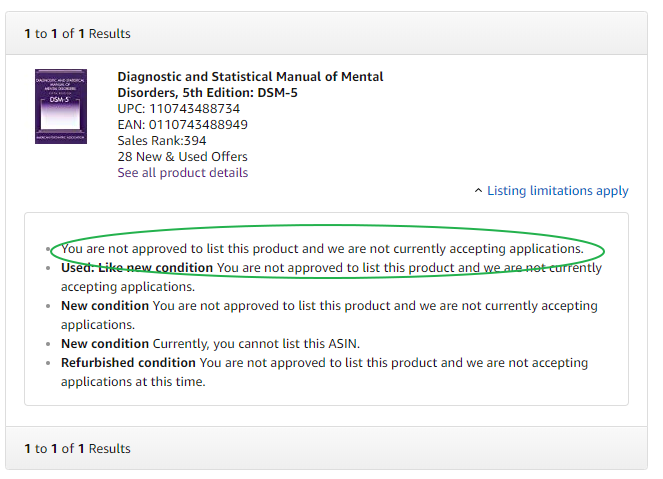 It will show you whether the item can be sold, and if so, under what conditions. 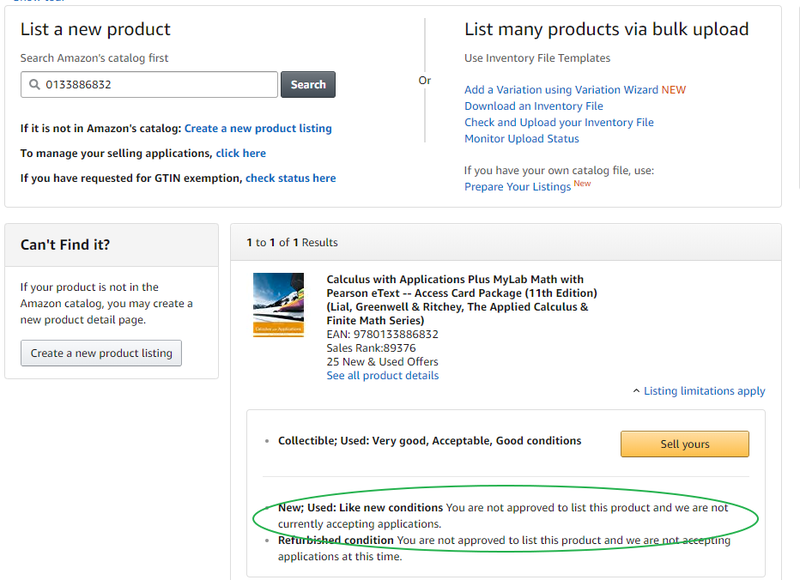 In this case you can see that you can’t sell this item as New or Like New. But, you can sell it as VG, G, or Acceptable. A lot of people are confused by Amazon’s sentence construction. In general, you’ll have four options. You can’t sell it at all. Basically nobody lists in Collectible, and Refurbished is its own can of worms, you can ignore that part. You just want the basics. New. Used. Nothing fancy or complicated about this. Now that we have established the concept of gating and how to identify it, let’s move on. What happens if you’re already sitting on gated inventory? This guy in green is gated. It’s not marked out-of-stock (OOS) because you’re never going to be allowed to go IN stock. So these are the items we pull from your shipment. But then you’re left with a conundrum. What do you do with them? No muss, no fuss. Of course, you might have to eat a little crow with your seller (and pay return shipping). But at least the matter is closed quickly and you can put your focus back on buying and selling– you know, the stuff that makes you money. Check out our Return Templates to make this as painless as possible. Option 2: Sell to someone who is ungated. After the rash of gatings in the fall, I saw this work pretty well on the textbook seller FB groups. People who were gated put out a call, with a list of ISBNs, offering the inventory at cost to anyone who could take it. This worked best if both the buyer and the seller used the same prep service, because then shipping wasn’t a consideration. Because gatings are frequently tied to the age/activity of a seller account, we have found that the more experienced sellers are more likely to be ungated than the newbies. So we have been compiling a list of long-term sellers to pass on to gated newbs. If you’d like to try selling your inventory to a more experienced seller, please email the office for a recommendation. However, they are business people too, and may negotiate sharply with you! This is an advanced method, typically used by online arbitragers who might have experienced a seasonal gating (for instance, Toys in Q4) or for some other reason might have gotten gated unexpectedly. These gated items are then listed on a third party site such as eBay. When a item sells, you simply put in a fulfillment order through Amazon and they will ship it to your eBay customer for a fee. I do not recommend this method for book arbitragers because the whole premise of online textbook arbitrage is to take advantage of the premium price Prime users are willing to pay. Unless you are pretty sure you can get someone to pay that premium on eBay, you probably don’t want to ship your items in. Try option 1 or 2 instead. 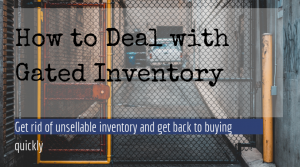 Gated products are a pain but they are a great, early object lesson in the importance of running through a system or procedure before ANY inventory purchase. Amazon is a business that requires systematic processes to ensure that you clear all the hurdles involved in the selling process. Once you get a system in place to verify your selling restrictions and a process for dealing with the ad hoc gating that may occur later, you’ll soon forget about all the stress this caused you in the past.